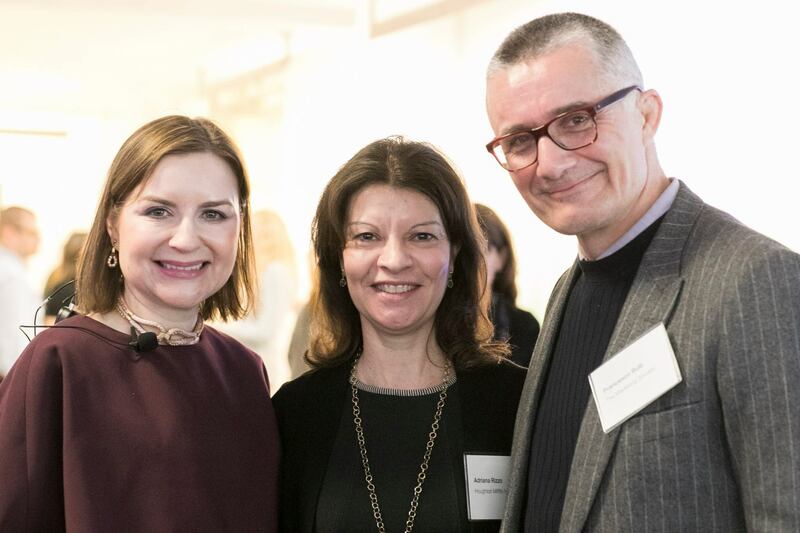 On March 8th global brand strategy firm, Siegel+Gale hosted its fifth annual International Women’s Day breakfast in New York City. Anchored by a lively panel discussion and moderated by S+G’s Global CMO Margaret Molloy, the morning was both intimate and broadly relatable. In attendance were over 70 senior marketing executives across a myriad of industries. Many had met before at previous Siegel+Gale events and reconnecting on this important day at such a pivotal time gave the event urgency and a sense of joy. The morning started with a special performance by Heather Massie, who presented a scene from her one-woman show “Hedy! The Life and Inventions of Hedy Lamarr!” Remembered almost exclusively as a beautiful and glamorous movie star from the 1930s-1950’s, Hedy was also a brilliant inventor who is responsible for, among other things, the underlying technology that has made mobile phones possible. With her compelling performance, Ms Massie captured the spirit of Ms. Lamarr and perfectly set the tone for the rest of the morning. Margaret, a master at moderating panels, quickly put everyone at ease while holding them accountable for thoughtful answers to her deceptively penetrating questions. On stage with her were Alicia Tillman, CMO at SAP; Michelle Froah, VP, Digital Transformation at Samsung Electronics America; Margaret Coughlin, CMO at Mt. Sinai; Joan Khoury Managing Director and CMO at Oppenheimer & Co.; Cynthia Kleinbaum, VP Brand and Retail Marketing at Bonobos; Rashmy Chaterjee, Global Sales Leader at IBM Security; and Doris Daif, SVP at the NBA. The ice-breaker question was for each panelist to name their “super-power” – an especially resonant phrase in the age of Wonder Woman and Black Panther, two movies that successfully showcase women who are badass, powerful, smart and in charge, all on their own terms. The panelists gamely identified themselves as good listeners, life-long learners and empathetic managers, all critical attributes in a good leader. Cynthia Kleinbaum had the most unexpected response, an immigrant from Mexico and a self-described lifelong “outsider” she bravely asserted that it was her naiveté that gave her power: the belief that everyone is great, unless proven wrong. Her innate positivity was a refreshing reminder that while women are grappling with important and difficult issues, there is every reason to feel confident and hopeful about the future. Particularly revelatory was Margaret’s request that everyone bring an item that embodied simplicity, perfectly tying into Siegel+Gale’s “Simple is Smart” philosophy. The items ranged from a blank sheet of paper signifying how a smart business strategy needs only one sheet of paper to be explained; a lemon zester because such a simple tool is able to bring so much flavor and nuance to any dish; a 5x8 card that outlined specific goals for 2018. Always put your best self forward regardless of your circumstances. A beautiful way, perhaps to describe how women have proceeded through the years and made the advances that have brought us to this moment in time. Make it personal for the men in your life: make it about their mothers, daughters, sisters. The morning ended with Margaret’s reminder that while leaders must navigate complex business issues, they are also called upon to navigate changes in opportunities, work environment and cultural experiences. By acknowledging their power and influence, women and men can #pressforprogress and be the change in the world that we need.